In 2011, on these pages, I wrote my most read blog post ever, titled: Does your bank achieve positive operating leverage? Even today, nearly six years later, it receives a material amount of views. Particularly from larger financial institutions. Economies of scale has eluded our industry in its purist form. For some time, banks between $1B and $10B in total assets tend to wring out the best expense ratios (operating expense/average assets) and efficiency ratios. So economies of scale hucksters walk with this chink in their armor as to why their story-line falters at a certain size. 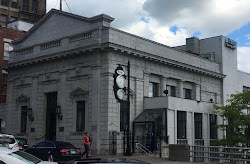 I also noted in my most recent and in all of my past Top 5 total return posts that community banks deliver superior returns to their larger brethren. So, although there are plenty of consultants and investment bankers with pitch books telling you to get bigger, there are also contrarians such as myself that believe that bigger is not always better. And my pitch book is simply a bunch of spreadsheets. No fancy bubble charts, green light/red light tables, or tombstones. In this post I would like to revisit a couple of tables. First, I broke down all commercial banks by asset size to show expense and efficiency ratios as banks became larger. The results are below. As the table suggests, financial institutions of all sizes reduced their relative operating expenses since 2011, with the only blip being a slight expense ratio increase in the $500MM-$1B commercial bank category. I should note that the efficiency ratio from that sized bank actually went down between 2011-16, suggesting a slightly better net interest margin. The economies of scale argument clearly has merit, as you can see from the table. As asset sizes increase, expense and efficiency ratios tend to decrease. With that pesky exception of financial institutions between $5B-$10B in assets. These are averages. So there are exceptions. And I have often spoken about there being a significant number of exceptions to the economies of scale bromide. One example is German American Bank, highlighted in American Banker's Community Banker of the Year issue, and on this blog. It is a $3B bank with a 55% efficiency ratio. Open Bank in Los Angeles is a $722 million bank with a 58% efficiency ratio. I didn't have to research small efficient banks. They rolled off my tongue. Actually, my fingertips. The below table was taken from my firm's profitability outsourcing database. We do the cost accounting for dozens of financial institutions that includes calculating operating cost per product account. Did costs go down at this granular level as assets grew? Obviously, no. But why? If assets grew, and the bankwide expense and efficiency ratio has generally declined as banks grew, how did these costs go up? It is a fully absorbed cost system, so all costs within the bank are allocated to products and services. My theory is this. Average balances per account have been growing since the low end of the yield curve has hovered near zero, and today is below 1%. The cost to originate and maintain a $100,000 money market account is nearly identical to originating and maintaining a $50,000 money market account. 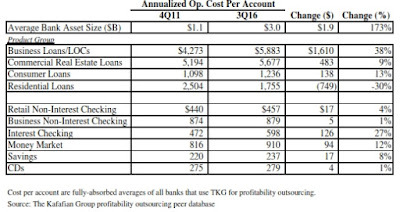 The growing average balance per account phenomenon has been occurring in most bank products. 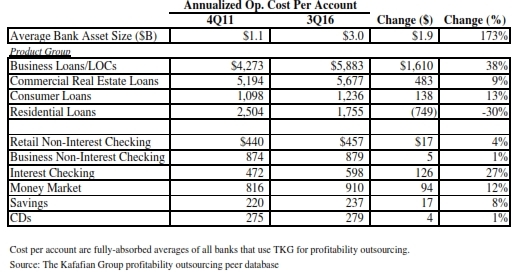 So, bankwide, costs would appear to go down because denominators, average assets in the expense ratio and total revenue in the efficiency ratio, are going up with the average balance per account. Number of accounts, however, have not been increasing at nearly the same pace as the balance sheet, if at all. So all of those resources at your financial institution designed to grow new account relationships have not been efficiently utilized. In other words, in account originations, financial institutions are generally, and on average, over capacity. Financial institutions have tried to reduce this capacity in branches by consolidation and staff reduction. That is why you don't see material increases in cost per account in deposit categories. But either through expense reduction or new account acquisition, there is more left to do.